Ukrainian fans who were detained after the Nations League game between Ukrainian and Czech teams in Uherske Hradiste, are released, as Football Federation of Ukraine (FFU) informed, Interfax-Ukraine reports. The talks with the police lasted till 2 am after the game was over. The Ukrainians can return home on Friday. 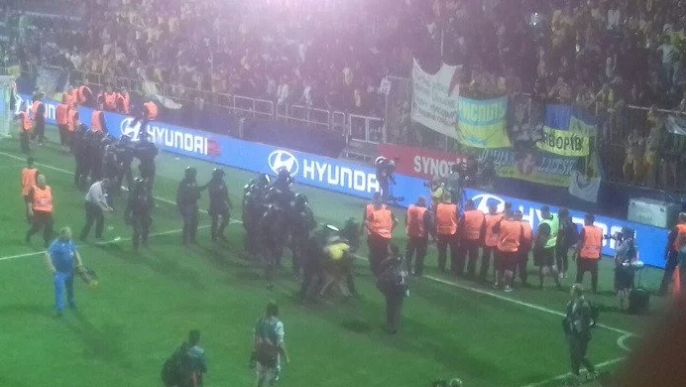 As is known, the Ukrainian fans were detained when rejoicing the victory of the team, they walked out of the borders of the stadium. More than a thousand Ukrainian fans were at the game. Earlier, Ukraine’s team played its first League of Nations game with the Czech team. Ukrainians wore a new uniform with a sign “Glory to Ukraine!”. The President Petro Poroshenko stated that this phrase would be the symbol of the victory. And he was right, Ukraine’s team won with a score 2:1.